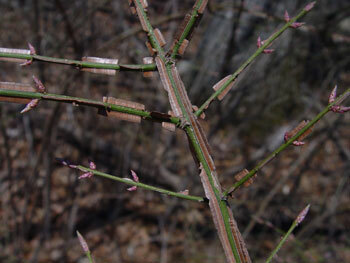 Perennial, deciduous shrub, broadly branched, up to ~15' tall, forms dense thickets. Some stems have corky "wings." 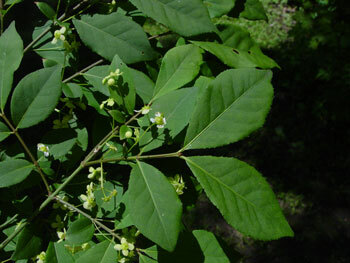 Leaves: Simple, opposite, roughly elliptical, tapered at both ends, usually 1-2" long, finely toothed. Vivid red fall color. 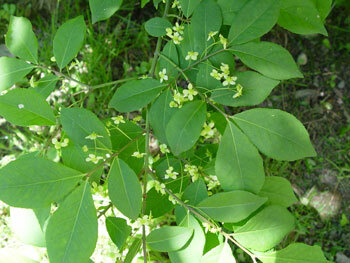 Flowers: Small (~1/4"), four-petaled, light yellow to light green, in small clusters coming off the twig on 1-3" peduncles. Bloom in late spring. Fruit: In early fall, a capsule of red-orange seed surrounded by two purple fleshy coverings which split open. May remain on plant into the winter. Reproduction: By seed. The fruit is eaten and dispersed by birds. No data on seed banking. Also expands vegetatively. Habitat: Forests, forest edges, old fields, open areas. Shade-tolerant, will germinate, grow, and reproduce under full canopy. Tolerant of moist to well-drained soil. 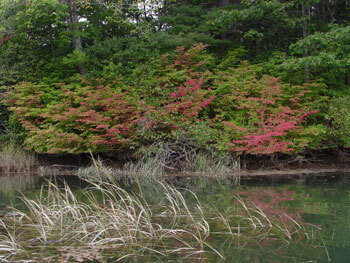 Similar native species: Several heath shrubs (blueberries, huckleberry) turn bright red in fall but these have alternate, usually entire leaves. 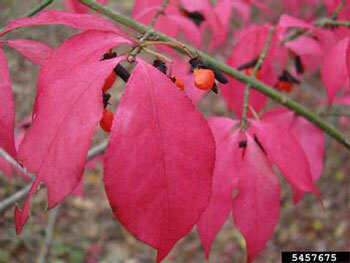 Similar non-native species: European spindle-tree (Euonymus europaeus) has pink seed coverings over its reddish seeds, and has less oval, stouter leaves. Wintercreeper (E. fortunei) looks similar but is usually an evergreen, climbing vine which is not known to have naturalized in New England. Japanese barberry can turn red in fall but has leaves in alternate nodes along the stem and sharp spines at the base of leaves. Small plants and seedlings may be pulled up by the roots when soil is moist; larger plants can be cut, but re-sprouting will occur. * Persistent cutting or mowing multiple times during the growing season over several years may kill the plant, but diligence is required. Mowing can prevent seedlings from establishing. Herbicides† are effective as foliar applications (2-3% glyphosate solution) or cut-stump applications (20-25% glyphosate or triclopyr solution applied immediately after cutting).